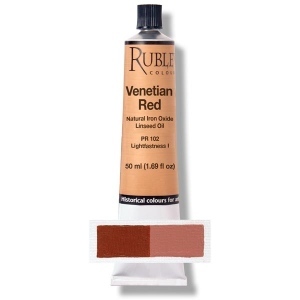 Details Rublev Colours Venetian Red is a transparent deep red earth with pink undertones, medium grained with good tinting strength and brushes "long" in the direction of the brush stroke. Our Venetian red comes from quarries in Northern Italy. Note: Some separation of pigment and oil may occur in Rublev Colours Artists' Oils and is a natural process when no wax or stabilizers are added to paint to prevent this from occurring.